Happy New Year, MLK Day and Year of the Monkey early! Around this time, many schools plan literacy events to remind families of the myriad benefits of reading books together. 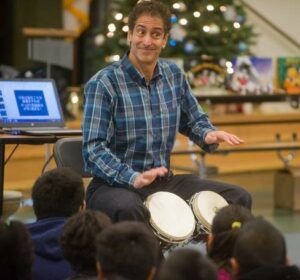 Family nights, compared to teacher workshops and daytime assemblies for students, are the high wire act of the literacy circus–unpredictable, yet exhilarating, with the power to inspire focus. Maybe your learning community has considered such an event before the usual doubts set in: What if nobody comes? What if 200 people come, ranging from newborns to grandparents, including folks with limited English? What if parents don’t look up from their iPhones? What if students don’t look up from their Gameboys? These fears are understandable, but fear not. Here are six ideas gleaned from my years of experience with bilingual family nights to encourage families to both attend and stay engaged. 1) Make students part of the program. Younger students can perform a simple song or dance rehearsed in class. Older students can read or act out short poems or prose. Invite a student orchestra or choir to perform, too. Parents will not only show up in droves but will snap up the best seats to videotape their kids! 2) Give students added incentive to attend by having them check in with their teacher at the event. Those who do can be excused from homework! 3) Encourage families to sit together during the program. This not only underscores that reading time is family time. It also keeps children focused and parents from talking and checking their phones. 4) If possible, serve an inexpensive meal–pizza, burritos, hot dogs, (meatless dogs? )–so that parents don’t have to feed their kids between coming home from work and attending the evening event. 5) If you have a budget, consider bringing in a professional speaker. Even a local community member can work well. The key is for the speaker’s interests and message about the importance about home-based literacy to resonate with your audience. 6) Keep the program fun and festive, and build on your success. By planning annual reading nights, you will condition more families to look forward to them in the future. Phew! I’m now ready to toe the high wire. In the coming months, I’ll be speaking in NM, TX, MA, NY and, of course, California where I live. If planning an event, signing onto an existing tour is a great way to save your school money. To inquire about piggybacking, or to explore a possible event in your area, please hit reply and drop me a line. Wishing you the best in 2016… Keep groovin’!